The right to health is severely restricted for the residents of Gaza in a way that would be inconceivable if enacted in a different setting. 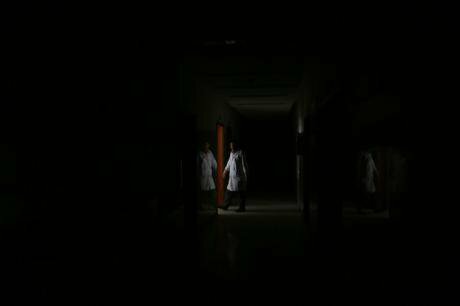 A Palestinian doctor walking in the corridor of Al-Durra Hospital in Gaza City where power shortages severely hinder the capacity to care for patients. February 8, 2018. Picture by Momen Faiz/NurPhoto/Sipa USA. All rights reserved. It is a feature of our political culture that health has become a powerful denominator in how we calculate social justice. The NHS and its challenges make our news almost every day. Providing accessible high quality health services is central to how we see good governance and civic entitlement. It’s a sentiment reinforced by frequent polls showing it to be the number one priority and for most of us in the UK, we have come to regard it as an incontrovertible ‘human right’. Not only in this country either. Generally we accept it as an ethical and desirable goal for others less fortunate within a narrative of ‘deserving’ and ‘entitlement’. This partly reflects a disquiet about our own political legacies. The unedifying scramble to abandon empire after the war was characterised by a pursuit of myopic vested interests rather than any serious attempt to improve the future ‘well being’ of the indigenous populations. We now respond to this historical echo chiefly through a prism of charity and sympathy. Health, registers strongly with our wish to do something positive. Though, such good intentions and values are not unconditional. Instead they are invested with a notion of ‘deserving’ that has been re-articulated through an apolitical model of needs. At best this obfuscates relationships of inequality and power, encouraging us to empathise across cultural boundaries as an act of altruism free from political judgement. In this context, the idea of ‘deserving’ is replete with language that corresponds with recipient gratitude and symbolic powerlessness. It’s a perspective that relies on imagery consistent with a requirement to see our donor values replicated in the moral compass of those who we seek to help. What happens when the population doesn’t match this depiction? The motivation to act effectively works on an ideological level as well as a humanitarian impulse. So what happens when the population doesn’t match this depiction; when they are seen behaviourally as antithetical to the notion of western norms around ‘deserving and entitlement’; choosing instead to assert identities that challenge their conditions by resistance? At this point the obligations of historical legacy are diminished. The altruism and concomitant ‘rights agendas’ that apply elsewhere are negated by alternative portrayals that define them into a lesser set of ethical imperatives. Ambivalence creeps in and suddenly ‘inalienable rights’ become matters for qualification. The pressure to jettison historical and political identities is paralleled by the demand to reform attitudes and behaviours in a way that demeans their aspirations. Failure to comply attracts sanctions and punishments that can only harm the civilian population and yet it is tolerated. Nowhere is this more true than for the Palestinians in the Gaza Strip, where Israel has exploited this ambivalence to the detriment of the health of the inhabitants. The denial of key health facilities and skills that we take for granted, have had real consequences on life and death. It’s not accidental. The recent report by Michael Lynk, the UN Special Rapporteur for Human Rights in the Occupied Palestinian territories noted that ‘restrictions imposed on Gaza also means there is little opportunity to seek care outside and that the dilapidated and failing Gaza health care sector is overwhelmingly a human-made crisis’. The tight restrictions on what can be brought in and who can leave has been central to the deterioration of the life chances of the most vulnerable. Doctors working in a fragile infrastructure and with a scarcity of resources that rarely make the news, frequently document the consequences. Higher than average rates of neonatal and maternal mortality particularly provide evidence of this impact. In 2015 in Gaza neonatal mortality rates were 21 per 1000 compared to 3 in Israel. The statistics are equally grim for maternal deaths. In the West Bank and Gaza the ratio was 31 per 100,000 whilst in Israel it was 2. Neonatal intensive care units have become overcrowded in the face of maternal malnutrition and rising rates of premature and low-weight babies. Add to this the effects of a severe fuel and electricity crisis caused by the ongoing Israeli restrictions on Gaza since April 2017 and Michael Lynk’s account of ‘the health and humanitarian crisis in Gaza bordering on a human calamity’ is not an exaggeration. Cancer services are amongst the hardest hit. Not only are operations to remove tumours precarious in the face of electricity and fuel shortages but his report highlights radiation therapy and medical diagnostics as non-existent because of the non-functioning of necessary instruments such as linear accelerators or CT scanners. Inevitably cancer diagnosis in Gaza is frequently made at the end stage of the disease. At the beginning of 2018, three hospitals had temporarily closed, along with thirteen primary healthcare clinics, affecting healthcare delivery to more than 300,000 people. Compounding the problem of treatment services has been the inability by Gaza hospitals to obtain Israeli permission to import replacement parts for vital diagnostic imaging equipment, putting them out of service for months and even years. One consequence of this acute crisis has been the compelling need to refer larger numbers of patients with serious or chronic health conditions to medical facilities outside of Gaza for treatment that they should be able to, but cannot, receive in the territory. Would we accept this situation if the roles were reversed? The World Health Organisation noted in October that 45% of patient applications to access health care outside of Gaza were unsuccessful and that 2017 was likely to see the lowest approval rate for applications to exit Gaza for treatment since documenting began in 2006. Translated into numbers, this meant an estimated 11,000 medical appointments were missed in 2017 by patients from Gaza whose travel permit applications were either denied or delayed. The WHO documented that 54 patients died in Gaza in 2017 who had applied for a medical travel permit, which had either been denied permission or who had not received an answer to their application. The severe restrictions in movement imposed by the Israeli blockade have meant that doctors and nurses in Gaza face significant hurdles in receiving permission to leave the territory to receive specialized professional training elsewhere: only 40 per cent of exit applications by health professionals were approved in 2017. These desperate facts invite several uncomfortable questions. Would we accept this situation if the roles were reversed? If the actions of the Palestinians meant the ‘right to health’ for Israelis was similarly compromised, would we allow it to continue? What if Tel Aviv had electricity for only 6-8 hours a day and cancer patients were dying as a result? Closer to home, is it time to recognise that Palestinian resistance to occupation does not disqualify them from our support? The right to health is severely restricted for the residents of Gaza in a way that would be inconceivable if enacted in a different setting. 100 years ago the Balfour Act began a process which relegated the Palestinians to second class citizens. Their subsequent resistance has been - whether we like it or not - a predictable consequence of our own double standards and colonial past. The ‘carve up’ of their land and the continued occupation by Israel have created collective hardships for which western donor governments routinely fail to hold Israel to account. We now have an obligation to redress this injustice and accord the Palestinians the same rights as we would others. The more we allow our humanitarian instincts to be contingent upon Israel’s iron fist approach to Gaza, the more we collude in an injustice that we would recoil from elsewhere. It’s time to look in the mirror and ask why we allow it to continue.